Frustration Mounts Over Puerto Rico's 'New Normal' As Federal Troops Leave The Island Army officials say they're beginning a drawdown of federal troops on Puerto Rico, even as many homes still lack power and clean drinking water. 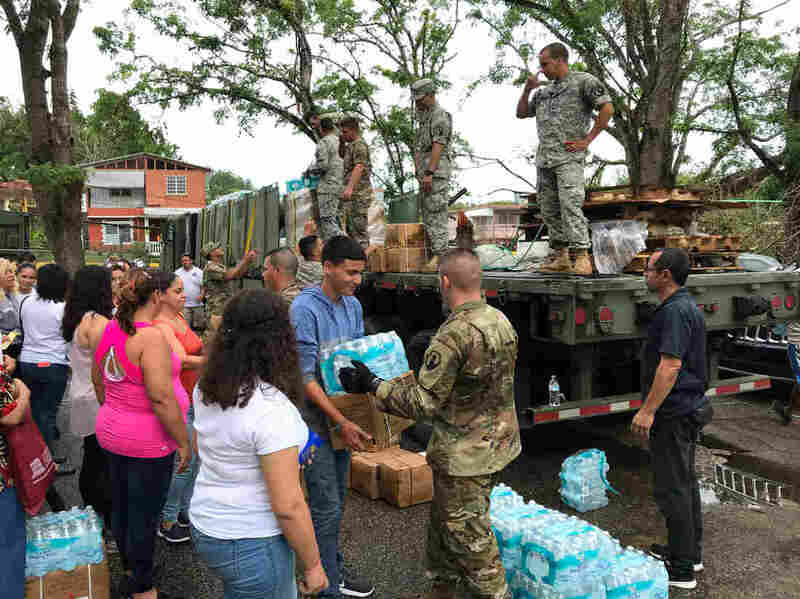 Army Reserve troops have been distributing water and other supplies in Morovis since Hurricane Maria struck more than six weeks ago. Capt. Morales says distribution points like this one are part of the "new normal" here. More than six weeks after Hurricane Maria hammered Puerto Rico, there's still no running water in Morovis, and the only power available here is supplied by emergency generators. Frustration is rising over the slow pace of recovery. Nonetheless, Army officials say emergency relief efforts on the island are drawing to a close. They're beginning a drawdown of federal troops. In a meeting with federal officials this week, Morovis mayor Carmen Maldonado asked for additional help, calling access to water "the critical issue" in the community. Maldonado says there are at least 400 elderly and bedridden residents who aren't able to lug home the cases of water they need. Lieutenant General Jeff Buchanan is leading the military's relief efforts on the island. In a meeting at the mayor's office, Maldonado tells Buchanan there were problems with the city's aging infrastructure even before the storm. Puerto Rico's water authority has said it's working to fix the problems with the pumps and filtration system in Morovis, but Maldonado says no one has been able to give her an estimate of when that will happen. Buchanan replies that his authority only goes so far. He's confident he can provide at least a temporary measure to restore electricity to the pumps, he says, but longstanding structural issues with the water system may be beyond his purview. The mayor is frustrated by the delays. Without power and water, Maldonado says, her city's economy is nearly at a standstill. The largest business in the city, a paper mill, was forced to shut down after it was damaged in the storm. Maldonado says it's now relocating to another municipality, taking 80 jobs with it. "It's a very sad situation," she says in Spanish, "because we are as important as any citizen in another municipality." She worries that mountain towns like hers are being neglected because their populations are smaller than cities on the coast. Roads are now largely cleared across the island, many supermarkets and stores have reopened and the military says the emergency is over. General Buchanan says Puerto Rico's National Guard will continue providing relief as long as needed, but he says federal troops under his command are going home. He doesn't like the word withdrawal, though. "It's not a withdrawal, it's a transition," he says emphatically. "We're transitioning more from the federal side of the military more to the state side of the military." Brigadier General Jose Reyes is with Puerto Rico's National Guard and he's working closely with General Buchanan. "In the military, it's a synchronized effort," he says. Buchanan says that this is a natural step for the army. "But we are concerned about how we talk about it, because we don't want people to get the wrong impression," he says. "They are not being abandoned whatsoever." But for the vast majority of people in Puerto Rico, life is still anything but normal. "I see a lot of helicopters bringing stuff. You know we are here," says Chaylin Palma. But, she says she hasn't seen any of the relief that's been flowing to the island, and she feels abandoned by the local government. "Where is all the stuff that's going into city hall?" she asks. 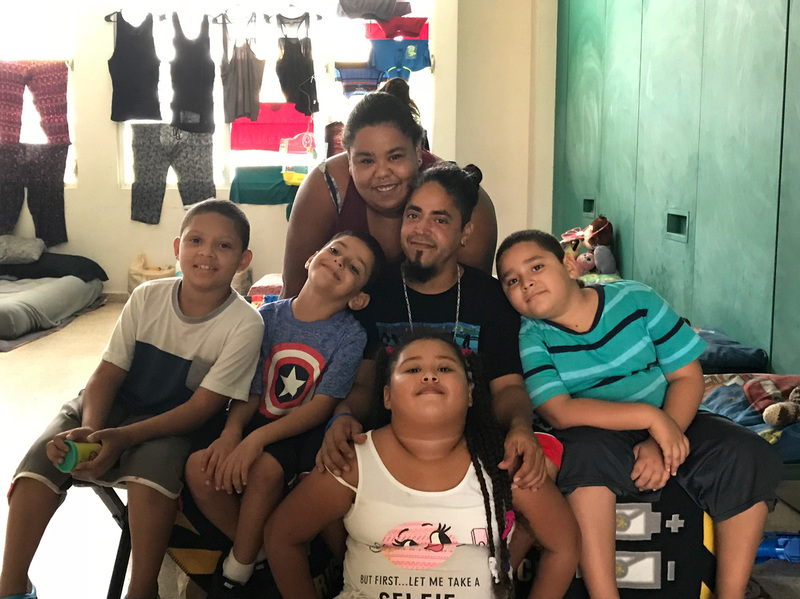 Chaylin Palma, her husband Miguel Nieves and their four children, (left to right) Johushua, Abimael, Chalyani and Miguel have been living in a shelter in a high school since their home was destroyed in Hurricane Maria. Palma, her husband Miguel Nieves and their four kids, ages 6 to 9, lost their home to Hurricane Maria. Since then, they've been sleeping on cots at the Josefa del Rio Guerrero High School in Morovis. The school is being used as a shelter and more than forty five days since the hurricane, 12 families are still housed at the school. The Nieves kids are chasing each other around the classroom they call home and asking each other what they want for Christmas. One says he wants a house made out of rocks like the Flintstones. Another just wants a new bed. Their mother Chaylin has her own Christmas wish, directed at Mayor Carmen Maldonado: "Find us a home. Find us housing. Get us out of here" she says, her voice rising in anger. "You're the mayor. This is your job." FEMA says it's sending a team to the city to help the dozen families at the shelter find temporary housing. Mayor Maldonado wants to reopen the schools. But that will only be possible after housing has been found for the families sheltered there—and after water service has been restored in Morovis.